Additional Info: Described by the New York Times as "an imaginative artist," Chilean-born flutist, Viviana Guzmán (www.VivianaGuzman.com) performs over 80 concerts a year throughout the world. 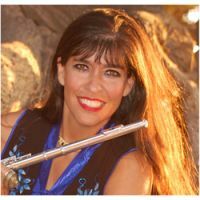 She has been featured on programs for PBS, NBC, and NPR, seen on the cover of Latina Style Magazine, and in COSMOPOLITAN en Español and has played in 118 countries including South Africa, Ireland, Spain, Brazil, Bali, India, Peru, Greece, featuring flutes from her collection of over 100 gathered from concert tours. Her music video was aired on UNIVISION in 30 countries. She has performed as soloist with orchestras in Russia, Chile, Vermont, New York, Wisconsin, California, Texas, and Montana, in such halls as in Carnegie Hall, Avery Fisher Hall in Lincoln Center, and other prominent stages with such artists as Mikhail Baryshnikov, Placido Domingo, and Glenn Close. Viviana began her musical training at the age of 5 and won her first competition at 7. By the age of 15, she played as a soloist with orchestra, studied with Jean-Pierre Rampal, and was featured on a John Denver nationally televised NBC special. Ms. Guzmán studied with James Galway, and Albert Tipton and graduated from the Juilliard School. Viviana has released seven CD’s entitled, "Telemann Flute Fantasies" (classical), “Planet Flute” (world), and “Danza de Amor” (latin), “Mostly Tango” (tango) and "Serenity" (National Geographic) "Meditations" (new age), and "Argentine Music".